BUENOS AIRES, Sep 17 2012 (IPS) - A bill that would lower the voting age from 18 to 16 is headed for approval in the Argentine Congress, in line with a reform that has already been adopted in Cuba, Brazil, Ecuador and Nicaragua, and that has begun to be debated in Bolivia, Chile and Uruguay. “Young people have an ability for critical thinking and autonomy, although people who say we don’t have awareness don’t know this. The people who think that way are the ones who have nothing to offer us,” said 17-year-old Nicolás Cernadas, vice president of the student centre at secondary school Normal 1 in Buenos Aires, and an active member of the left-wing Partido Obrero (Workers Party). In a conversation with IPS, he said he was not only in favour of lowering the voting age, but of demanding other rights as well. “An adolescent is as easily influenced as someone who is 40. Nor does waiting till the age of 18 change much. I’m not stupid until my next birthday, nor do I all of a sudden become aware of everything because I turned 18,” he said. The governing faction of the Justicialista (Peronist) Party, the centre-left Frente para la Victoria, which has an absolute majority in the legislature, introduced a bill to allow 16 and 17-year-olds to vote if they want to – voting is compulsory between the ages of 18 and 70 – and to make it possible for foreigners to vote if they have lived in the country as legal residents for at least two years. The sponsors of the bill say the aim is to build a stronger sense of citizenship among young people and immigrants, by “deepening the process of political participation.” They also say it responds “to a growing demand for participation” among young people. The opposition parties are divided. Those who are in favour question the timing of the move, or insist that voting should also be compulsory for 16 and 17-year-olds. A series of public hearings will be held on the issue with experts in education, psychologists, student leaders and others, to consider the different stances. But the bill is expected to pass without any problem. “It’s not a bad thing to expand rights, but if the age of adulthood starts at 18, there should be coherence,” Julia Pomares, an expert with the non-governmental Centre for the Implementation of Public Policies for Equity and Growth, told IPS. Pomares said there were “other priorities,” on the electoral front and with regards to youth policies. But she criticised opposition politicians who reject the bill on the grounds that adolescents are uninformed, or that it could benefit the governing party. “There are 50-year-olds who are uninformed. This is about autonomy,” she said. Nor can an alleged electoral benefit for President Cristina Fernández’s party “disqualify the debate,” she added. Today, no one questions that women’s suffrage, approved in this country in 1947, was a right. Nor does anyone point out that it favoured the re-election of Juan Domingo Perón, whose wife Evita (Eva Duarte) played a key role in women gaining the right to vote. In Cuba and Nicaragua, voting is compulsory starting at age 16, while in Ecuador and Brazil it is optional for 16 and 17-year-olds, and compulsory for those over the age of 18. In Brazil, the optional youth vote has been in force since the presidential elections of 1989. Political scientist Jairo Nicolau of the Federal University of Rio de Janeiro told IPS that back then, “there was an atmosphere of freedom and expanding rights,” which meant “there was neither a big debate on the question, nor outspoken opposition.” The fact that voting was to be optional for 16 and 17-year-olds also facilitated approval of the law, he added. Teen turn-out at the polls was high the year the law went into effect, but began to steadily decline. In 2006, the percentage of youngsters in that age group who voted was seven percent higher than in 2010, according to the Superior Electoral Court. Chile is also considering following suit. Senator Alejandro Navarro of the left-wing Movimiento Amplio Social (MAS) party told IPS that the proposed constitutional reform under study in the lower house of Congress would reduce the compulsory voting age. 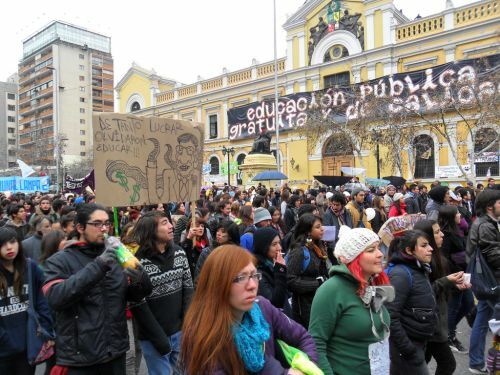 The mass student protests in the streets of Chile over the last few years, led by both secondary and university students, has raised the idea in society that young people have rights, and that they should be able to vote at the age of 16, he said. But Navarro said the parties of the centre-right coalition led by President Sebastián Piñera will not support such an initiative, because what they want instead is to limit the exercise of such rights. Navarro was referring to a new law that he wrote, which three years ago gave youngsters over the age of 14 the right to vote for the neighbourhood councils. The debate has now shifted to lowering the age of criminal responsibility. “Just as they have duties, they also have rights,” he said. A similar controversy has broken out in Uruguay, where the opposition insists that if 16-year-olds are allowed to vote, they should also be treated as adults in the criminal justice system. Although the age of criminal responsibility in Uruguay is 14, until the age of 18, adolescents are treated differently from adults, and are dealt with by youth courts, in line with international conventions. But right-wing Senator Pedro Bordaberry of the Colorado Party introduced a bill to treat 16 and 17-year-olds as adults in the justice system. And enough signatures have been collected to hold a plebiscite on the question in the 2014 elections. The initiative is backed by the centre-right National Party, and is opposed by the governing left-wing Broad Front coalition. Meanwhile, National Party legislator José Cardoso said he was confident in the progress that would be made by a bill he presented in June 2011, to lower the age of compulsory voting to 16 on the condition that the age of adult criminal responsibility would also be reduced. “The approach must be complete, and obligations should be balanced with rights, in the constitution,” he told IPS. “Recognition that people are fit to reach decisions at the age of 16 gives rise to two facets: punitive questions as well as rights. “The consequence of the first is adult criminal responsibility, and the consequence of the second is voting,” he said. “The participation of minors in crimes has triggered heated debate, and in that context, support has grown for positions in favour of lowering the age at which youngsters can be held criminally responsible, under the understanding that in the context of today’s society, the age of minority is being abandoned at younger and younger ages,” Cardoso said. Left-wing Senator Lucía Topolansky, the wife of President José Mujica, has said she is in favour of reducing the voting age, but argues that it is separate from the issue of the age of criminal responsibility. However, the left has not unanimously taken that position. * With reporting by Marianela Jarroud in Santiago, Fabiana Frayssinet in Rio de Janeiro and Darío Montero in Montevideo.